Throw pillows are a great way to pull together the design of any indoor or outdoor living space. Follow these steps to ensure your throw pillow is made to the correct specifications. Use a firm (carpenter's) tape measure, rather than a flexible (tailor's) measuring tape for the most accurate results. Keep in mind that when ordering, you will need to round up or round down to the nearest 1/2 inch. You may find it helpful to have someone else hold the pillow while you take measurements. Pillow dimensions are based on measuring along the edge of the pillow, not the width of the stuffed pillow. Once filled with poly fiber, the height and width will be slightly less than the measurements ordered. 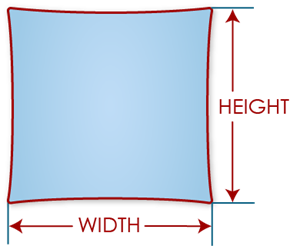 For example, a 12" x 12" pillow will have perceived finished dimensions of 11" x 11" when stuffed. Step 1: Grasp the top and bottom corners of the pillow and pull the fabric tight. Step 2: Measure the pillow's height, from top to bottom, along the edge of the pillow. Step 3: Grasp the left and right corners of the pillow and pull the fabric tight. Step 4: Measure the pillow's width, from top to bottom, along the edge of the pillow. DO NOT measure the pillow diagonally. DO NOT measure the pillow across its center. Lumbar pillows should be measured the same way as throw pillows. Simply follow the directions above to get an accurate measurement. If you have any questions, give us a call or send an email. Our customer service representatives will be glad to help.